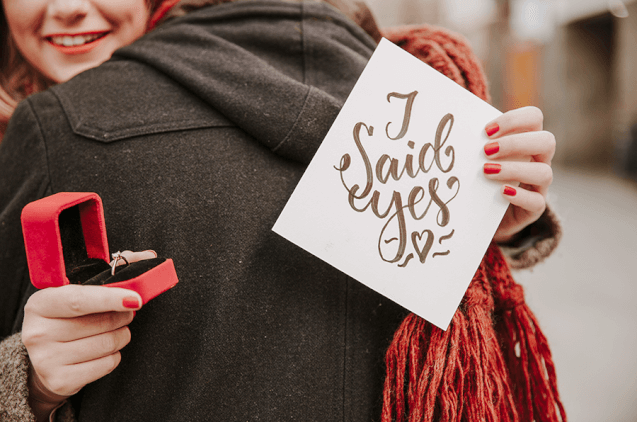 With the passing of the holidays, #ISAIDYES is trending; the Facebook and Twitter newsfeeds are filled with joyful soon to be brides announcing that their significant others proposed. If this is you, first of all Congratulations! You’ve officially taken the first step to your happily ever after. Like many soon to be brides, the next step may be unclear or overwhelming. Follow RentALL Affairs step by step guide to planning your wedding. We will break down the planning process order that is recommended by professionals in the industry. Now that you’re engaged, you first step is to discuss you and your fiancé’s desires. Be sure to discuss the time of year, time frame for engagement, and desired theme of your wedding. i.e. Will you have a winter wedding? Will you have a long engagement and get married in 2020? Have you always dreamed of a beach wedding? Are you a “no frills” bride? Would you like a small, intimate wedding? Before you begin looking at anything, I mean anything, pick your budget and stick to it. If your parents will be contributing to the overall cost of the wedding, be sure to include them in this discussion. Be sure to stick to your budget through the planning process. According to CreditCards.com, using a credit card can prevent an ill-timed snafu from turning into financial regret. Check out their list of items that may be beneficial to charge, assuming you are borrowing reponsibly. Now that you’ve figured out your budget, you and your fiancé can begin making your guest list. On average, couples spend 45-50% of their budget on the venue. According to TheKnot.com, the average wedding cost is $31,213. This means that roughly $15,000 of the average wedding is spent on the venue. Knowing this will help you get a good idea of about how many guests you can invite, and how much you are willing to spend on each guest. Now that you’ve discussed “The Big Idea”, it’s time to pick a venue. According to The Bridal Guide, picking a venue and date are pretty high up on the list. You’ve done some basic calculations, and you know how much you can spend per person. Before visiting a venue, call them and get an average cost per guest. This way, you don’t waste your time if the average cost is way off from your budget. Some choose to wait, but we think that the bridal party can be a huge help in the planning process. They may have insight from previous weddings of their own, or they may know people in the industry who can offer you great pricing and availability. David’s Bridal recommends that you secure your wedding gown at least 9-10 months in advance. It is a good idea to bring your brides maids, and any other important ladies with you to your appointments. Your emotions will be running high and you are going to want their opinions. With all the trending wedding invitations, it can be overwhelming to decide which one is perfect for you. A consultation with a personalized wedding invitation designer, will allow you to choose exactly what you want, and customize the inviations up to the last detail. Ordering invitations online can sometimes result in disappointment. Colors and textures may be misconstrued through your computer screen. Erica Bresnen, a personal wedding invitation designer from RentALL Affairs in Feasterville, Pennsylvania declared that, “Brides are often pleasantly surprised by the accommodation and affordable pricing of customized wedding invitations”. All of the hard work that you have done will without fail, need MORE WORK. Your guest list may change when you begin to receive your RSVP’s, one of your vendors may fall through. Things can happen, and they always DO! You can be the most organized, particular Bride in the world and still face obstacles that are out of your control. Try to stay calm and when inevitable things happen, try to shrug them off. You are getting married my dear! Congratulations and Best of Luck!